BOULDER, Colo., Feb. 25, 2010 – In what is being touted as a major breakthrough, University of Colorado at Boulder physics professors, Margaret Murnane and Henry Kapteyn have built a tabletop x-ray laser for superhigh-resolution imaging that could also open doors to new technologies in medicine, biotechnology and nanotechnology. Working with their team at JILA, a joint institute of CU-Boulder and the National Institute of Standards and Technology (NIST), for more than a decade Murnane and Kapteyn have been inching closer to this goal, which scientists have been trying to figure out for nearly half a century. "Our goal is to create a laser beam that contains a broad range of x-ray wavelengths all at once that can be focused both in time and space," Murnane said. "If we have this source of coherent light that spans a huge region of the electromagnetic spectrum, we would be able to make the highest resolution light-based tabletop microscope in existence that could capture images in 3-D and tell us exactly what we are looking at. We're very close." Murnane and Kapteyn presented highlights of their research at the American Association for the Advancement of Science, or AAAS, annual meeting in San Diego, during a panel discussion about the history and future of laser technology titled "Next Generation of Extreme Optical Tools and Applications." Most of today's x-ray lasers require so much power that they rely on fusion laser facilities the size of football stadiums or larger, making their use impractical. Murnane and Kapteyn generate coherent laser-like x-ray beams by using an intense femtosecond laser and combining hundreds or thousands of visible photons together. And the key is they are doing it with a desktop-size system. They can already generate laser-like X-ray beams in the soft x-ray region and believe they have discovered how to extend the process all the way into the hard x-ray region of the electromagnetic spectrum. "If we can do this, it could lead to all kinds of possibilities," Kapteyn said. "It might make it possible to improve x-ray imaging resolution at your doctor's office by a thousand times. The x-rays we get in the hospital now are limited. For example, they can't detect really small cancers because the x-ray source in your doctor's office is more like a light bulb, not a laser. If you had a bright, focused laser-like x-ray beam, you could image with far higher resolution." 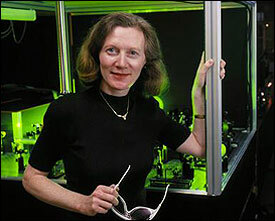 Their method can be thought of as a coherent version of the x-ray tube, according to Murnane. In an x-ray tube, an electron is boiled off a filament, then it is accelerated in an electric field before hitting a solid target, where the kinetic energy of the electron is converted into incoherent x-rays. These rays are like the incoherent light from a light bulb or flashlight -- they aren't very focused. In the tabletop setup, instead of boiling an electron from a filament, they pluck part of the quantum wave function of an electron from an atom using a very intense laser pulse. The electron is then accelerated and slammed back into the ion, releasing its energy as an x-ray photon. Since the laser field controls the motion of the electron, the x-rays emitted can retain the coherence properties of a laser, Murnane said. Being able to build a tabletop x-ray laser is just the beginning, said Kapteyn. "An analogy that is pretty close to what is going on in this field is the MRI, which started as just a fundamental investigation," said Kapteyn. "People then started using it for microscopy, and then it progressed into a medical diagnostic technique." Murnane and Kapteyn were recently recognized with the American Physical Society's Arthur L. Schawlow Prize in Laser Science for "pioneering work in the area of ultrafast laser science, including development of ultrafast optical and coherent soft x-ray sources." The prize, which was endowed by NEC Corp. in 1991, recognizes "outstanding contributions to basic research which uses lasers to advance our knowledge of the fundamental physical properties of materials and their interaction with light." Nobel laureates and CU-Boulder physics Professors Carl E. Wieman (1999) and John L. Hall (1993) also have won the award. The total range of wavelengths, extending from the shortest to the longest wavelength or conversely, that can be generated physically. This range of electromagnetic wavelengths extends practically from zero to infinity and includes the visible portion of the spectrum known as light.